Our core server banks are located in Vancouver, British Columbia, and Toronto Ontario Canada in state-of-the-art facilities. Our redundant high-speed fiber connections to the Internet guarantee that your website visitors will get to your website quickly without having to wait more than a small fraction of a second. We employ smart routing technology that lets our network choose the fastest path to your clients and routes around problems automatically! Make your website a reliable resource for both your employees and customers. Our upstream providers redundantly connect to the five largest worldwide Internet backbones, which provides the fastest access to your site around the world. Also included is redundant UPS, generator backup and smoke detection/fire protection systems, all constantly monitored by trained technicians 24/7/365 giving our clients a continuous and safe web hosting environment. We regularly expand our server capacity as our service continues to grow. Our servers operate on the average at 20% capacity, and rarely above 40% of their maximum computing limits. Our web servers are Red Hat Enterprise Linux based systems using the latest in server and hosting configuration software. We have state-of-the art software and hardware firewalls which monitor and control our network and servers. We maintain high performance, ultra-fast, Dual Parallel Processing Hexa Core Xeon linux-based web servers (24 CPUs per server; each loaded with minimum 32 gigs of RAM) with the latest server software installations so that our customers can get the most out of their website hosting experience. We offer continuous and full technical support when you are in need of help. Every server is also configured utilizing a RAID 5 storage array, so your website data is always available. 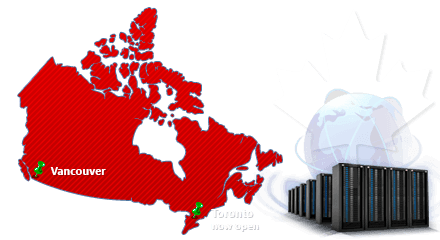 Additionally, each server fully backed-up weekly and safely in Vancouver and Toronto. Availability of your website is 100% guaranteed. Our network is fully redundant with more than 15Gbps available capacity from multiple providers. With a multi-gigabit capacity, peering with Canada's top carriers at the TorIX, consistent quality of service, a 24/7 Network Operation Center and a wide range of additional optional hosting services, our hosting network is built for serious Internet operations. 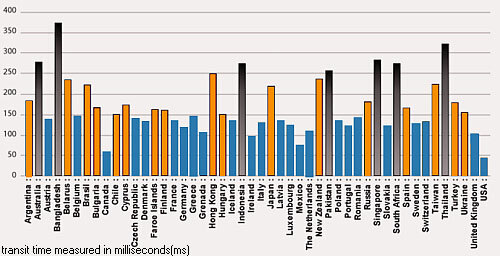 below chart: average global response times for our servers (milliseconds). We have latest billing systems which has automated invoicing system so that you can enjoy your services without any hindrances. Every customer has his/her own billing login in which one can check billing history and payment options. Our support system leaves nothing to be desired. We have a manned 24/7 support system (Full telephone support for escalated problems). When our customers open a ticket the response time from our end is 1 hour max. You can expect a very thorough professional response. You can rest well knowing your website will always be functioning.